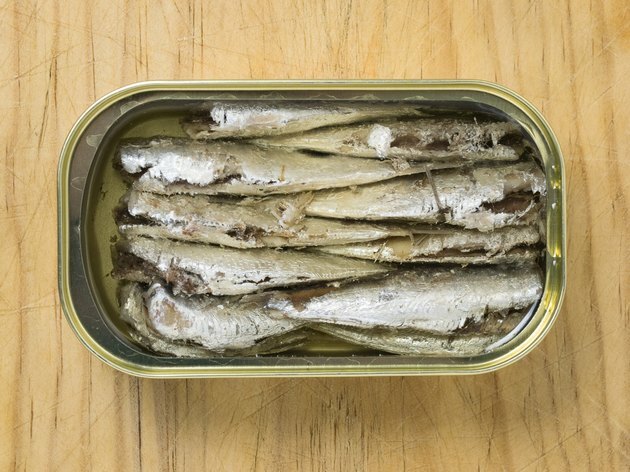 Are Sardines in Water Better for You Than in Oil? R. Jane Jester-Hebert is a Master Herbalist, nutritional consultant and Pilates Mat-certified. With over 20 years in the natural health and nutritional field, she draws from her vast knowledge and clinical experience to create health and nutrition articles. More than 20 varieties of sardines from the United States, France, Portugal, Norway and Spain are caught, processed and canned. They are available packed in oil, water, and mustard or tomato sauce. They are also available smoked. Canned sardines are a rich source of protein, amino acids, vitamins and essential fatty acids; they are used by the body to reduce inflammation, build and maintain bones and support the nervous system. Sardines canned in water are a healthier option with lower cholesterol and lower fat than those canned in oil. The average cholesterol in a 3-ounce can of sardines in water is 30 milligrams, while sardines in oil have 40 milligrams of cholesterol. The 2010 Dietary Guidelines for Americans suggest that you limit cholesterol to 300 milligrams per day or 200 milligrams per day if you have heart disease. On average, the total fat in a 3-ounce can of sardines in oil is 11 grams of total fat with 5 grams of saturated fat; sardines in water have 5 grams of total fat with 1.8 grams of saturated fat. Sardines are second only to calf liver in providing the highest amounts of vitamin B12 in foods. Vitamin B12 supports the nervous system and can reduce the risk of cardiovascular disease. Vitamin D, selenium and protein are also found in canned sardines. The nutrient content of sardines is similar whether they are canned in water or oil; however, read the nutritional label for the percent of each nutrient, due to the variety of can sizes and servings. Omega-3 fatty acids from sardines in olive oil and omega-6 fatty acids from corn and soybean oil provide essential fatty acids the body is unable to make on its own. The body needs more omega-3 than omega-6 to reduce the risk of heart disease and inflammation. Since olive oil is higher in omega-3 than other oils, sardines in olive oil contain more omega-3 than sardines in water; however, the sardines in water are still the better option with lower amounts of cholesterol and fat. As defined in the 2010 Dietary Guidelines for Americans, sodium should be limited to 1,500 milligrams a day in active individuals. The upper limit of sodium intake should not exceed 2,300 milligrams per day. An average 3-ounce can of sardines in water has 200 milligrams of sodium, and sardines in oil have 400 milligrams of sodium. If you have sodium concerns, consider that sardines canned in mustard contain higher amounts of sodium than those canned in water or oil.